The statistics say it all. 40 to 50 percent of young women on college campuses today are disordered eaters. By the time girls reach age 13, 80 percent report dissatisfaction with their body and their weight and have been on diets. Disordered eating, which includes skipping meals, dieting, restricting foods or entire food groups, emotional overeating or under-eating, eating only when hungry, etc., has virtually become a norm in our society today. High school girls report that food restriction and issues of weight management have become a constant preoccupation of peers, and particularly of athletes. In a world where the true meaning of healthy eating has become lost or distorted, disordered patterns such as restricting foods that contain fat or sugar have come to be considered "healthy." Though disordered eating is clearly not an indicator of a clinical ED, it can become a precursor or trigger to the onset of a clinical ED in the genetically susceptible individual. Disordered eating is on the rise, and along with them, these most lethal of all the mental health disorders, appearing in children at ever younger ages. Children are being diagnosed with anorexia by age 7, and the average age of onset has dropped from ages 13 -17 to ages 9 -12. Distinguishing between disordered eating and a clinical ED deserves attention, though both conditions warrant diagnosis. 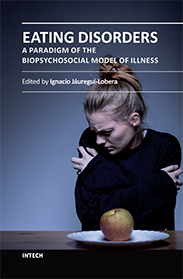 Disordered eating crosses the line into a clinical eating disorder when immoderate, imbalanced eating habits become choice-less and excessive; when compulsive thoughts and preoccupations about becoming fat preclude other thinking, interfering with learning and normal daily function; and because ED are biological diseases, when predisposing clusters of genes are responsible for the metamorphosis. We all eat in disordered ways at times. It is hard to avoid missing a meal now and again when we are busy and on the run or have had a large snack too close to dinnertime. These kinds of behavioral patterns are not problematic for a non-eating disordered individual. What distinguishes disordered eating from occasional quirky or spotting eating is the purpose and consistency behind the behavior, and whether or not the person maintains a sense of flexibility or free choice with regard to the eating behaviors. If disordered patterns serve to promote weight loss, increase athletic prowess, or purge food consumed, they can become potentially dangerous. Consider this scenario. A child runs out of the house in the morning without breakfast because she has overslept and is worried about missing the bus. That is a normal scenario, as seen in the child's response once she gets to school. Feeling hungry, she grabs a midmorning snack and eats a larger lunch than usual, taking in more calories to satisfy her appetite. Another child believes that by skipping breakfast she is showing strength and self-discipline in her restraint, getting her started on food restriction for the day. If and when she does eat that day, she will probably feel fearful, guilty and anxious about having sabotaged her self-control and having given in to her “weakness.” This youngster has a problem. The best way to be, and remain, thin and healthy is to eat at least 3 meals a day, along with snacks, consisting of all the food groups. Fat free eating is not healthy eating. Any excessive behavior is an unhealthy behavior in its extreme nature. Food is to be enjoyed, not feared. Disordered eating in yourself or your child needs not develop into a clinical eating disorder, particularly when there is early recognition of signs and effective intervention. Recognizing disordered eating is a first line of defense in prevention of more serious eating related problems. 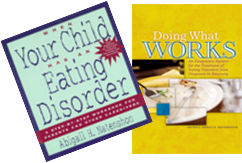 With disordered eating or clinical eating disorders, an ounce of prevention is surely worth a pound of cure.